One of the absolute favourite parts of my spiritual practice and yoga is connecting with my Goddess energy. In yoga, there is a fantastic Goddess pose, Utkata Konasana, that allows us to connect to the personal qualities of the many Goddesses that exist within all of us. The story of the Goddess that I’m going to share in this week’s Namaste Yoga & yoga classes comes from Sally Kempton. “These aren’t helpers,” the goddess retorted. “They are aspects of myself!” To prove it, she drew the other goddesses back into her body and went on to kill the demons single-handed—proving that the power of the eternal shakti is invincible. Each one of us has the power of Shakti, Durgha, Kali, Parvarti, Annapurna, and Lakshmi within us. David Frawley describes Shakti as the real power behind the manifest universe, the energy of the Goddess. “Shakti is the vitality, feeling and awareness, through which we set in motion both our outer actions and our inner spiritual practice,” describes David Frawley. If we are looking for examples of shakti we need look no further than her various forms in the food we eat and the air (prana) we breathe. Shakti is the powerful creative energy that underlies all things in the universe. 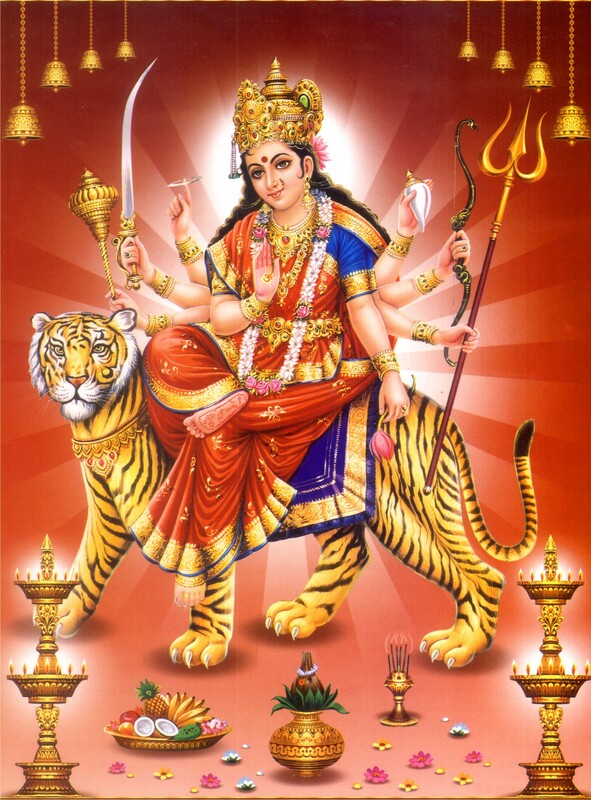 Durga is a Hindu Goddess known as the Divine Mother of protection. Durga rides a lion which is symbolic of her mastery over power, will and determination. Her arms are full of weapons to slay demons and negative forces yet her face is kind and compassionate. Durga is said to be the power behind a dramatic breakthrough and the strength we can draw on when faced with a challenging situation. It is said that her sword cuts through obstacles and rights imbalances. Kali is the fierce compassionate Goddess who destroys evil. Kali is the Goddess of time, known to dissolve all things. She will sweep into your life to encourage swift transformation. Not happy to leave you the way you are, Kali assists us in destroying our egos so that the path may be clear for our spiritual progress. Kali is one of the most mis-understood Hindu Godesses because of her fierce image. The garland of skulls that she wears around her neck is nothing to be feared, rather are symbolic of the sound vibrations that are manifest as thoughts, all of which are devoured when we meditate. Parvati is the Goddess of determination and discilpline. The only Goddess who was able to distract Shiva from his aescetic practices, Parvarti teahces us not to take no for an answer. Parvarti was known for continually asking Shiva about his knowledge of scriptures, refusing to be intimidated by him. In fact it was Parvati who awakened Shiva’s concern for the wolrd by questioning him on various issues. Annapurna is the Goddess of food and cooking. It was Annapurna who provided Shiva with the food that gave him the energy to achive his knowledge and enlightenment. Annapurna is all about nourishment and asks us to to devote ourselves to our own nurturing self-care. Through Annapurna we learn that food is alchemical and to use it to support us in our transformative practices. In what ways do I access the life-giving energy of shakti to open me to my own inner empowerment? What are some current obstacles I’m working through? In what ways do I need to reinforce boundaries as a way of maintaining balance? To what extent do I connect with the fierce, strong, wild, and forceful aspects of my personality? Where in my life do I draw from the archetypal energy of Parvati, refusing to be intimidated, pressing forward with determination? What forms of abundance do I express gratitude for? List several examples of good fortune in your life. Next post: Why is it called “Phoenix Rising” Yoga Therapy?